Portland was an entirely different place back in 2008. The music community was still an actual community not divided, nor were the skylines divided by the rooftops of newly built condos and startups. On top of all this, Explode Into Colors basically exploded into the scene, offering a sound unlike the typical "I'm sad and everyone knows it" vibe Portland was used to. Though they never actually made it to releasing a full album, their legacy of haunted noise punk lives on as does their advocacy for all-ages spaces. Drummer Claudia Meza, who like many of us and especially ones that didn't necessarily grow up in Portland, grew up absorbing the influence of live performances. All-ages venues were once an important facet for developing creative youth and are, for the sake of Explode Into Colors dual reunion sets today, something still deserving of the music community's attention. "It's crazy to me that Portland, which boasts such a vibrant music scene, doesn't have a proper all ages space where up and coming bands are able to grow and play," says Meza. "Every city needs an all ages space, it creates community, totally makes better musicians, and it fosters a more inclusive and varied music scene. Every adult in every local music community should feel a personal responsibility to help make all ages spaces a reality." 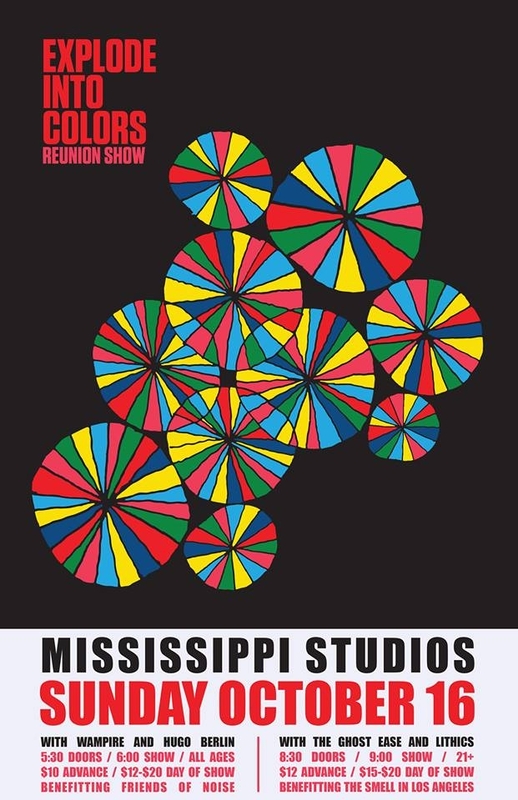 That's why Explode Into Colors will be playing two sets tonight at Mississippi Studios. The first one is open to everyone with Hugo Berlin and Wampire also on the bill, starting at 6pm. It's a benefit for Friends of Noise, an organization dedicated to providing a safe all-ages space and all-ages shows in Portland's various neighborhoods. Explode Into Colors' 9pm set with Lithics and the Ghost Ease is 21+ and sold out, with proceeds going to keeping LA's the Smell open for its diverse masses.